In less than two weeks, Italian Prime Minister Matteo Renzi might become the next victim of the current anti-establishment global trend, as Italians vote on a controversial referendum seen as a plebiscite on Renzi himself. In less than two weeks, Italian Prime Minister Matteo Renzi might become the next victim of the current anti-establishment global trend – which started last summer with Brexit and was recently epitomised by the elections in the US – as Italy prepares to vote for a constitutional reform that many Italians perceive as a plebiscite on the prime minister himself as well as a chance to subvert the status quo in one of the founding member states of the EU. The referendum is staked on a complex change to Italy’s constitution that the PM and his allies argue will make the country easier to rule by disempowering the upper chamber of parliament, the Senate. Proponents claim the reform is necessary to get rid of the byzantine bureaucratic system and encourage major investments, both locally and from foreign investors. Critics of the constitutional change, which was approved by parliament but lacked a sufficient majority to avoid a referendum, have claimed that it is potentially treacherous as it leaves too much power in the hands of the executive and will extend parliamentary immunity to the new members of the reformed senate, who will be elected by party leaders instead of a popular vote. The problem, as Marco Travaglio, a leading independent journalist and editor in chief of the fiercely anti-establishment newspaper “Il Fatto Quotidiano”, puts it, is that those who will compose the reformed upper chamber represent “the most corrupted section of the Italian political body” often involved in corruption scandals, pointing out that even the trustworthy ones will not be able to serve both mandates effectively. The rift in Italian society created by the proposed constitutional reform is profound, and has reshuffled traditional ideological positions not only among the general electorate, but particularly within the centre-left ruling party (PD) led by Renzi. The prime minister is being strongly criticized by a vociferous minority within his own party and by the main opposition faction, the Five Star Movement, for “personalizing” the referendum, as he threatened to resign in case of defeat and warned about the possible disastrous economic consequences if the referendum does not pass. What is worth noting, in the sclerotic and often chaotic Italian political arena, is that among those opposed to the constitutional reform, are nominally left-wing organizations like trade unions, the Association of Italian Partisans (ANPI), consumers’ associations and extra-parliamentarian radical left groups. Although the overwhelming majority of the country’s most respected constitutionalists and law professors have raised serious doubts about the reform, and many have started openly campaigning against it, the government has dismissed its critics by labelling them in favour of maintaining the status quo and resistant to change and progress. Surprisingly for a centre-left party, Renzi’s reform has controversially been endorsed by the very influential association of Italian industrialists (Confindustria), big operators in the stock exchange market, as well as the most powerful bureaucrats in the EU, including president of the European parliament, German social democrat Martin Schultz. In a recent state visit to the White House, Renzi happily accepted the support of president Barack Obama, who during a joint press conference in the Rose Garden openly endorsed Renzi’s reform. Moreover, Renzi also enjoys a strenuous backing by the Italian media at large, especially, his critics argue, by RAI, the government-controlled public broadcaster. But the critics within his own centre-left Democratic Party fear that some Italians will seize the opportunity provided by the referendum to convey anger with Mr Renzi’s two-year-old government, as the economy remains flat-lined and youth unemployment steadily holds at around 40%. Since he took power, replacing fellow party member Enrico Letta, without going through the ballot vote and creating a controversial parliamentary majority by including members of Silvio Berlusconi’s party Forza Italia and representatives of the right in his executive, Matteo Renzi has not been able to significantly boost the economy despite a number of new reforms intended to revitalize the job market and cut the omnipresent red tape of Italian bureaucracy. The Italian referendum might also assume a pivotal role in boosting the anti-establishment and right-wing populist movements in Europe. In 2017, the old continent will see elections in France, Germany and the Netherlands, where the parties of Marine Le Pen, Frauke Petry and Geert Wilders have been significantly increasing in popularity and, in the case of Le Pen’s Front National, might be a contender for the French presidency. In Italy though, the main anti-establishment front, represented by the Five Star Movement – founded by the boisterous, politically incorrect comedian-activist Beppe Grillo – has distanced itself from those parties, especially regarding their xenophobic stances. Since its inception, the Five Star Movement has defined itself as ‘post-ideological’, trying to lure voters from the disenfranchised radical left and the liberal right. Recent polls have consistently put the party close, if not ahead, of Renzi’s PD. As of today, the majority of polls regarding the referendum have the “No camp” (opposed to the reform) consistently ahead, but have also underlined that roughly 25% of the electorate remains undecided. But pollsters have also been cautious about their data, as they’ve recently been left red-faced when it came to their predictions on Brexit and the US Presidency. 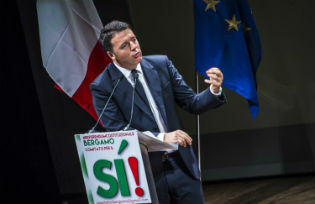 In order to convince Italian voters to vote “Yes (Sí)” for his reform, Matteo Renzi has already begun an intense campaign tour across Italy, holding up to three speeches a day and appearing on numerous TV programs. His recent decision to send a letter to almost four million Italians living abroad in order to convince them to back his reform sparked anger amongst his opponents, as they accused him of having diverted state funds to enhance his political agenda. The consequences of the Italian referendum – to be held on the December 4 – might not only redesign the political landscape in the boot-shaped country, the third most important state in Europe with regards to funds to the EU and political commitment to the European project, but it also might seriously undermine the cohesion of the Union after the shocking exit of the UK and the ongoing refugee and migrant crisis. In the case of victory, Renzi would have the indirect mandate to continue governing until 2018, enhancing his political agenda even though his latest reform of the job market and the economy have yet to be proven successful. He’ll also have a chance to sit at the table with Germany in an effort to broker a more advantageous deal aimed at easing the stringent austerity measures imposed by the the EU Commission to boost the stagnant Italian economy. If it fails, as he had pledged when he launched his constitutional reform campaign – even if lately he’s been trying to backtrack from that position – he will have to resign, and his government could be replaced by a temporary administration of unelected technocrats with the task of transitioning Italy to new elections, once again instilling uncertainty and doubts in the future of Italy specifically and the European Union as a whole. Michele Monni is a freelance journalist and analyst graduated from the University of Modena and Reggio Emilia in Communication Sciences. He holds a Masters in International Journalism from the University of Central Lancashire. He’s a contributor to the leading Italian newsmagazine “l’Espresso” and the Italian News Agency ANSA. His articles and reportages have been published in l’Espresso, Avvenire, Il Reportage, The National and Vanity Fair Italy.